Virtualization has been gaining attention and adherents faster than ever, but the context of virtualization to business outcomes has been sketchy. Hewlett-Packard on Sept. 2 announced a series of products and services designed to place virtualization into a business and economic framework, one that helps enterprises flexibly embrace virtualization in the content of IT transformation. The goal is to use many virtualization products and attain the needed professional services in a way that optimizes the outcomes and paybacks from virtualization activities, to make them related and managed holistically over an IT transformation lifecycle. While much of virtualization has focused on hardware reduction through higher utilization and more efficient platforms, virtualization is at a larger tipping point. The technologies and techniques are extending deeper into storage, applications, desktops, and even allowing enterprises to experiment with cloud computing benefits and efficiencies. Virtualization needs to play well with itself at its various stages of use, across a variety of platforms and vendors, and it needs to play well too with the physical IT assets and resources. In a sense, virtualization is taking the need for managing and exploiting heterogeneity to an even higher level, with more dynamic and complex elements. It's a clarion call for management in total -- but with huge potential paybacks in terms of lower costs, greater agility, and improved security and control. HP is well suited to pounce on the opportunity for bringing the variety of virtualization advances into cohesion, with management and risk reduction as the fore-thought, not the after-thought. So it's not surprising that HP on Sept. 2 unleashed a substantial set of announcements around virtualization -- spanning hardware, management, software, alliances, professional services ... and above all, vision. HP is proposing that virtualization be re-thought in business terms and within a context of larger IT transformation undertakings, such as data center consolidation, application modernization, IT shared services, cloud computing, SOA, and next generation data center architectures. Virtualization is becoming ingrained across IT. To better understand the new role and return for virtualization, how HP approaches the issues, and to gain more details on the Sept. 2 news, BriefingsDirect conducted a panel discussion with Greg Banfield, consulting manager for the HP Consulting and Integration (C&I) Group infrastructure practice; Dionne Morgan, worldwide marketing manager for HP’s Technology Services Group (TSG), and Tom Norton, worldwide practice lead for Microsoft Services at HP. 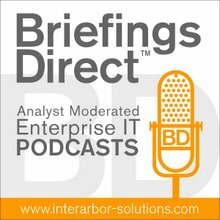 Our podcast is moderated by me, Dana Gardner, principal analyst at Interarbor Solutions. What’s interesting about virtualization is that, as companies have started to work with virtualization, the easy assumption is that you are really reducing the numbers of servers. But, as you expand your knowledge and your experience with virtualization, you start looking at comprehensive components in your environment or your infrastructure. What’s interesting about this is that when you get into a virtualized environment, there's a need to understand the heartbeat of the virtualized environment and understand what’s going on at the hardware level. As you grow up from there with the virtualized machines, you have to understand how the virtual machines themselves are performing, and then there's got to be an understanding of how the actual applications are performing within that virtual machine. So, management and virtual machine management, overall a comprehensive approach to management, is critical to being successful. One of the key [benefits] areas is cost reduction. Virtualization can help with major cost savings, and that can include savings in terms of the amount of hardware they purchase, the amount of floor space that’s utilized, the cost of power and cooling. So, it improves the energy efficiency of the environment, as well as just the cost of managing the overall environment. Strategy is becoming even more important. Our customers are very aware, as everyone else is now, that they have many options available to them as far as virtualization, not only from a perspective of what to virtualize in their environment, but also from a number of partners and technology suppliers who have different views or different technologies to support virtualization. ... We assess what’s happening in the organization from a people, a process, and a technology perspective. We benchmark against what’s happening in the industry, making recommendations on where a customer can actually improve, on some of those processes to improve efficiency, and to improve on the service level they are providing to the business. We also assist with the implementation of some of those process improvements. If you look at this from a full lifecycle perspective, HP provides services to assist with everything from strategy, to design, to transition, to the ongoing operations and continual improvement.